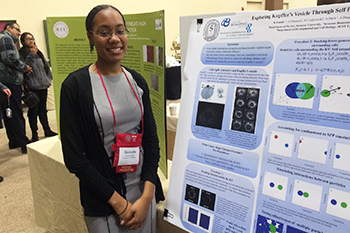 Eight scholars in the Collegiate Science & Technology Entry Program (CSTEP) presented their research at CSTEP’s 24th Annual Statewide Student Conference. The conference theme this year was “Journeys Beyond Excellence,” and was aimed at embodying the nearly 30 years of CSTEP programs. The conference was attended by over 550 participants, representing more than 40 colleges and universities across New York State, with nearly 200 students presenting their research via oral presentation or poster. The conference took place April 8-10 in Lake George. Founded in 1986, CSTEP prepares students for successful careers in medicine, law, education, technology, engineering, healthcare, accounting and more. CSTEP is active in more than 50 colleges and universities across New York State, and supports students who are New York State residents and are among underrepresented populations in STEM and pre-licensure fields. CSTEP is housed in the School of Education and is part of the Center for Graduate Preparation and Achievement. The annual conference is an opportunity for members of the CSTEP community to come together and share in the display of intellect, talent and creativity.